Bathroom Remodeling - 5 Star Reviews! WORKING WITH KITCHEN EXPRESSIONS IS EASY, ENJOYABLE AND CONVENIENT. OUR PROPRIETARY Bath PROJECT DEVELOPMENT SYSTEM ENSURES SPECTACULAR RESULTS . Looking for a bathroom design and bathroom remodeling contractor? Our bathroom remodeling projects can range from simple upgrades to elaborate transformations, and the bathroom remodeling process can be daunting, especially for those who are unfamiliar with these types of projects. The abundance of products and design options make bathroom projects significantly more complicated than other types of remodeling projects. 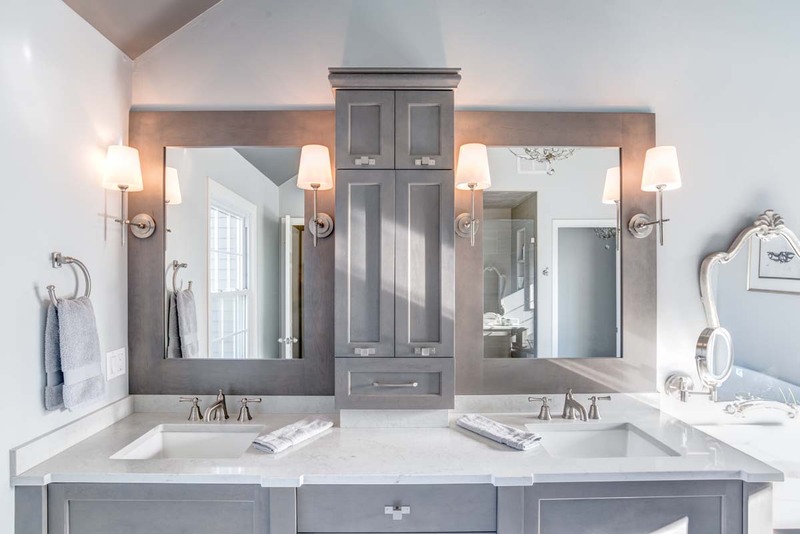 Smart homeowners choose to work with a professional Bathroom Designer at Kitchen Expressions, based in Summit New Jersey, to a create a precisely defined plan that meets their needs and desires and serves as the roadmap for the entire project. Proper planning is essential to the success of your bathroom remodeling project. Initial Showroom Consultation: Your project is very important to us – it is recommended that you call ahead and schedule an appointment with a Designer in our Summit, New Jersey showroom – this will ensure that your project receives the undivided attention it deserves. You should allow at least one hour so that you have time to discuss your thoughts and ideas and your needs and wants. Your Designer will guide you through our displays, educating you on our product offerings, and learn about your likes and dislikes. We’ll discuss your potential budget and explain how the entire process will work. 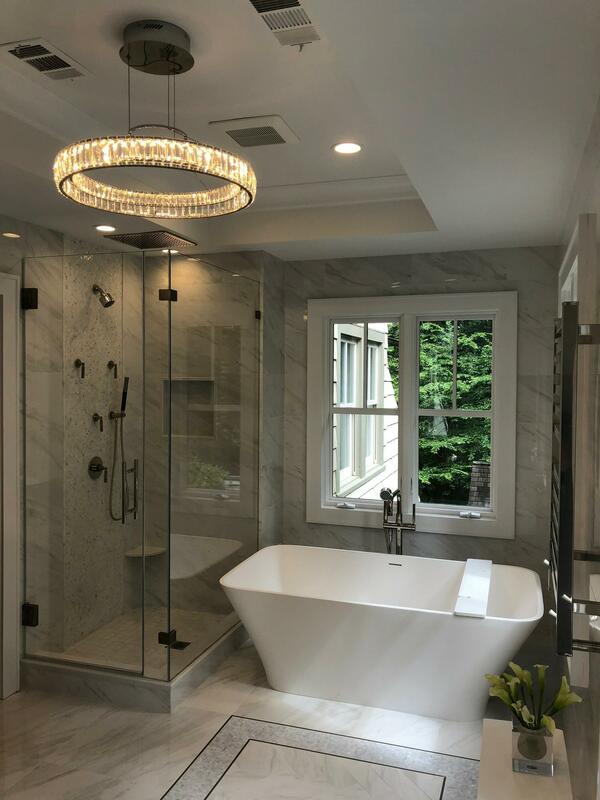 When you are ready to proceed to the Design Phase, you will be asked for a reasonable design fee, depending upon the scope of the bath project. Home Visit: The Designer will meet with you in your home to evaluate the existing bathroom space, take detailed measurements, and address your functional and aesthetic goals, including any special needs or considerations. The measurements of your bathroom area will then be incorporated into an “existing conditions” drawing for further evaluation during the Product Selection/Design Direction meeting in our Summit, New Jersey showroom. Product Selection/Design Direction: Your Designer will meet with you in our Summit, New Jersey showroom to discuss the design possibilities and chart the overall course for the project. 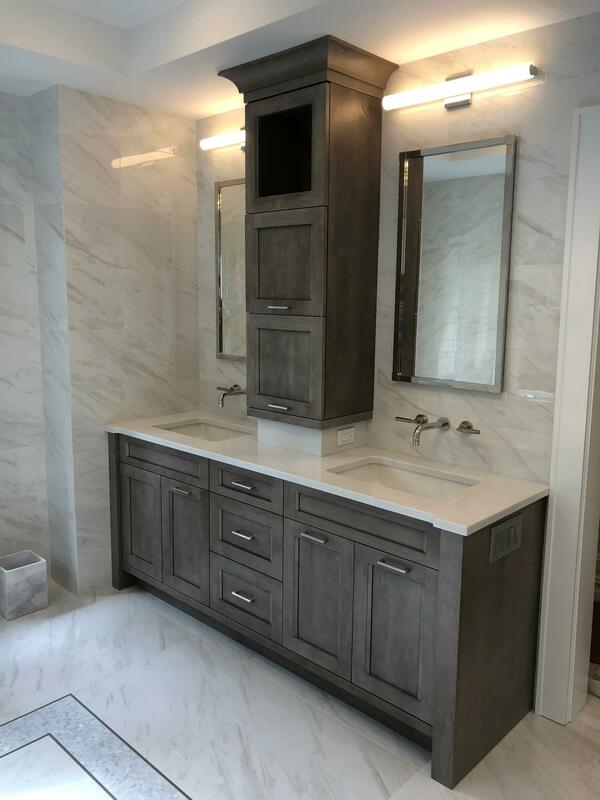 You will also make various product selections, including cabinetry, countertops and decorative plumbing fixtures, all of which will be incorporated into the plans for your bath. Planning: After your Product Selection, the Designer will develop a 3-D model of the bath to permit you to experience the proposed bath before any work has commenced. A set of AutoCAD plans will be prepared to further illustrate and clarify the scope of the bathroom remodeling or bathroom renovation project. Design Presentation: You will be invited back to the showroom for a subsequent meeting to view the plans and options for your new bath. Our color-rendered 3-D model allows you to virtually walk through and view your project from all angles and to evaluate alternative options, if any. After the Design Presentation, your Designer will follow up with you and provide pricing for the products that have been selected (and any alternates) and a quotation for any required construction labor. Construction Phase: Once you have approved the bath renovation and design plans and all product and finish selections and construction labor quotations, the spectacular transformation of your new bathroom will begin! If applicable, our construction team will obtain any required permits from your building department. The materials will be ordered, and our craftsmen will be scheduled. All deliveries and installation dates will be carefully coordinated with you. Our talented craftsmen are the best in the business and will pay careful attention to every detail of your bathroom design and renovation. Your home will be treated with the utmost care and respect and the job site will be cleared of refuse daily – we want to provide you with an exceptional renovation experience while your bathroom is being renovated. Final Inspection: At completion of your bathroom renovation, you and your Designer will conduct a final inspection together with a member of the construction team, to make sure everything in your new bath is to your (and our) satisfaction. Warranty: Enjoy your new bath! Our construction teams workmanship is warrantied for a full year and includes an 11-month “check-up call” to make sure all is well. If you have any questions or require service, please contact your Designer. A TRULY EXCEPTIONAL PROJECT – A bath remodel involves a variety of elements that need to be carefully and thoughtfully addressed and coordinated. At Kitchen Expressions, our highly-experienced and talented Designers navigate our Clients through every element so that the completed bath greatly exceeds their expectations!